Breatheasy 99% solvent free, with antibacterial formulation for a cleaner kitchen environment. Specially formulated to help kill 99.9% of household germs on the paint surface. Steam resistant and wipeable. Matt finish. Approx coverage 14m2 per litre. 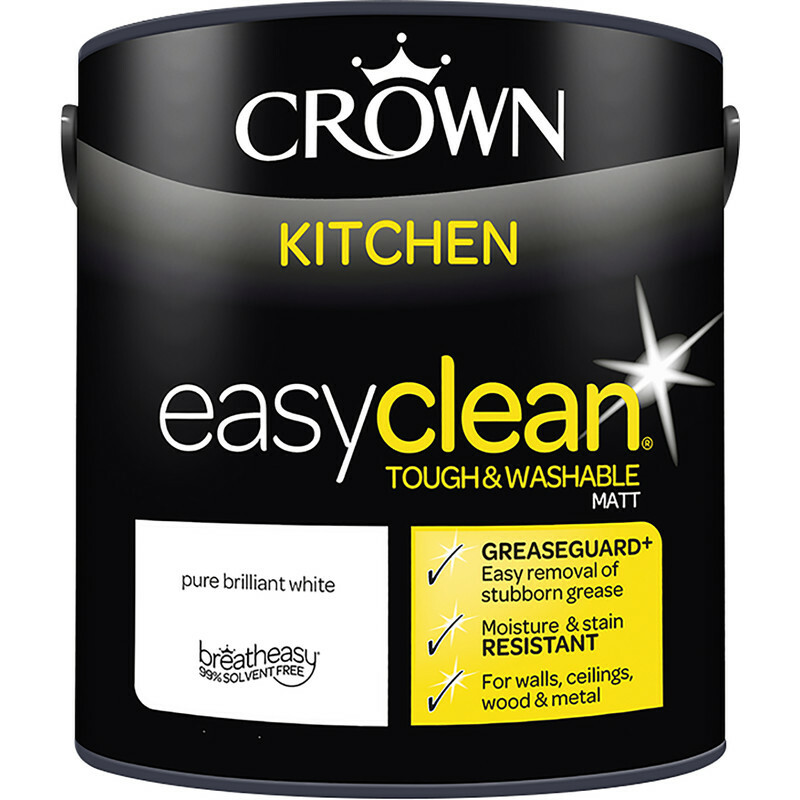 Crown Breatheasy Kitchen Emulsion Paint 2.5L Pure Brilliant White is rated 4.0 out of 5 by 5. Rated 4 out of 5 by Toby Prin from Goes on thick Painted over a cheap white base coat, difference was vast. This paint is dense. Reasons for four stars, a - it’s not cheap, b - I haven’t tested wipe clean / anti fungal. Off to a good start though. Rated 5 out of 5 by CharliesMum from Very good quality Very pleased with Crown paints - it's made the kitchen look so good and fresh (was previously Magnolia for several years!). Have used Crown paints previously, and are happy to recommend them. Rated 1 out of 5 by Jeca from Don't bother Thought this might be ok seen as"kitchen paint", but no, the usual crown watered down milk biz. If you are papered to do three coats then fine. Odour is quite strong too. Rated 5 out of 5 by Hopkins from Covers well Good coverage and little odour..you get what you pay for when buying premium brands.